Outgoing Serjeant-at-Arms Anil Parakrama Samarasekera officially hands over the Mace to his successor Narendra Fernando. Every time the Members of Parliament get to the middle of the House, he rushed to the podium where the Mace is kept to prevent the MPs from grabbing it. He has intervened on countless occasions to separate the MPs who were falling out with each other, and interestingly, he has removed about 10-15 MPs from the Chamber on the orders of the Chair, for misbehaving. Privileged to have a ringside view of the main Chamber and be very much at the centre of the affairs of the House for more than two decades, outgoing Serjeant-at-Arms Anil Parakrama Samarasekera spoke to the Daily News, recollecting his profound memories of Sri Lanka’s Parliament. Anil Samarasekera, who retired on August 30 after 22 years of Parliamentary service, will take up his new role as a Consultant to Parliament from today (3). Samarasekera has been asked by Speaker Karu Jayasuriya to take up the affairs of the Parliamentary Select Committee on Communal and Religious Harmony, which will be appointed shortly. “That is what I have been assigned for the moment and more responsibilities will be given in the days to come. I am happy to extend my advice on security matters and any other related areas when Parliament needs such help,” said Samarasekera, commenting on his new appointment. Prior to joining Parliament as the Assistant Serjeant-at-Arms on November 1, 1996, Samarasekera was a commissioned Naval officer and also received one year’s training with the Indian Navy. “There were only two ways to leave the Navy officially; either you have to contest in an election or you have to wear the robes. I preferred the first option and gave my nomination for a by-election, and then left the Navy. But the training I had in the Navy was of great help to me throughout my 12-year stint as the Serjeant-at-Arms,” he recalled. Samarasekera said that he was deeply honoured to work under incumbent Speaker Jayasuriya, adding that he considers it a rare privilege. He immensely admired the qualities and personality of Jayasuriya, and went onto state that he was the best Speaker that he had worked under. Samarasekera refreshed his memory to speak on a few interesting episodes that he had witnessed in the Chamber. He recalled that the in-House clash of MPs on June 8, 2004, where Ven. Akmeemana Dayaratana Thera and Ven. Kolonnawe Sri Sumangala Thera were attacked, was the worst incident that he had seen in the Chamber. A group of UPFA MPs, who were in the then ruling party, assaulted the two JHU monks and tried to obstruct the swearing in of new MP Ven. Akmeemana Thera. “Both the monks were badly injured and hospitalised after the assault,” he recollected. “There was a real brawl going on between the Government and the Opposition. Some went up to the Speaker’s chair and they were fighting even behind the Speaker’s chair. I had to rush to Speaker W. J. M. Lokubandara and hold his chair as otherwise he would have fallen,” he said. “What we usually do is that we try to separate the two clashing parties, but we may not succeed all the time,” he added, also recalling the recent incident where UNP backbencher Sandith Samarasinghe had to be hospitalised after an in-House free-for-all. At the end of the row which broke out when Minister Field Marshal Sarath Fonseka took the floor on May 3, 2016, MP Prasanna Ranaweera and Deputy Minister Palitha Thewarapperuma were suspended from Parliament for one week by the Speaker for their unruly behaviour. The retiring Serjeant-at-Arms remembers this incident as one of the worst brawls in recent times in Parliament. The Serjeant-at-Arms is the custodian of the ‘Mace’ which symbolises the authority of Parliament. The Mace is composed of a staff of ebony with ornamentation in silver, 18-carat gold and blue sapphires. “It is a gift from the British House of Commons. It was valued 2,500 sterling pounds in 1949. It weighs 28 pounds and measures 48 inches in length,” said Samarasekera who carried the Mace at the commencement and the end of each day’s sittings. He recalled there have been ample times when the MPs tried to grab the Mace and run to obstruct the proceedings. One such incident he remembered well was how JVP Trincomalee District MP Jayantha Wijesekera ran off with the Mace on February 22, 2007. This was following a speech by then JVP Parliamentary Group Leader Wimal Weerawansa (Weerawansa defected from the JVP in 2008) on the Ceasefire Agreement between the Government and the LTTE. “I went and spoke to MP Weerawansa asking his intervention to get the Mace back. He asked me not to worry stating that MP Wijesekera will soon return the Mace as he cannot hold it for a long time. As said, the MP handed over the Mace within about 5-10 minutes. The House resumed with the Mace in its rightful place following a 10-minute suspension,” he reminisced. He also recalled that MP Mahindananda Aluthgamage ran off with the Mace on the day that two monks were attacked in Parliament. “MP Aluthgamage was dancing with the Mace in the members’ lobby. With much effort, we managed to get the Mace back after about 35-45 minutes,” he said. Samarasekera also called to mind how late MP T. Maheswaran ran away with the Mace on December 4, 2004, while his UNP colleagues were demonstrating demanding the suspension of Parliament until former Minister S.B. Dissanayake (a UNP MP at the time) was released from jail. This was soon after the Supreme Court convicted MP Dissanayake for contempt of court for a speech he made. “The Mace was slightly damaged as a result of that incident,” he explained. “Another unforgettable incident is how the Opposition members sneaked a mini-coffin into the main Chamber. They had assembled the coffin at the members’ wash rooms. Therefore the Parliament security personnel could not detect it during the routine checks at the entrance,” he remarked. He was referring to the mock funeral procession enacted in the Chamber on June 19, 2003, by the PA and JVP members including former President Mahinda Rajapaksa (the then Opposition Leader) and former Prime Minister D.M. Jayaratne (a senior SLFP member at the time) in protest of “political killings.” Joseph Michael Perera was the Speaker at that time. Refreshing his memories on the day the Joint Opposition staged an all-night demonstration on the floor of the main Chamber, Samarasekera said, “My Deputy, Assistant, a few other Parliamentary service assistants and I were up throughout the night. From time to time we went in trying to negotiate with them to leave the Chamber but none of them wanted to do so,” he said. This was on April 20, 2015, barely three months after the election defeat of former President Mahinda Rajapaksa. The Joint Opposition staged the protest against summoning the former President to the Bribery Commission to record a statement. “Altogether there were about 20 MPs inside and they stayed until about 5 am in the morning. Some MPs were sleeping, some were seated, some were even reciting gathas and preaching Buddhism and some were meditating. We didn’t provide them any food, but on and off they walked out and came back,” he narrated. The outgoing Serjeant-at-Arms said that within his tenure, he had asked about 10 MPs to leave the main Chamber as their dress did not match the approved dress code. He further said that there were about 10-15 incidents where he was asked to remove the MPs for disobeying or disregarding the authority of the Chair, for deliberately interrupting the proceedings, or violating Parliamentary Standing Orders. “In such instances, the Speaker has to pass a motion with the consent of the House. Most members did obey and walk out when I spoke to them, but in the most recent case of MP Dinesh Gunawardena, he refused to go. That is why the Parliament Police had to be called in,” he said. The list of MPs he was asked to remove also includes seniors like former Prime Minister D.M. Jayaratne and MP Vasudeva Nanayakkara. Samarasekera said that he would never forget the day that Parliament conducted a brief sitting while the whole area was inundated due to flood water. This was on November 11, 2010, when the heaviest rains in 18 years submerged the Parliament building. “There was about six inches or more of water in the Ground Floor. When I went to my office to get dressed, I saw my shoes floating in the water in the changing room. I had to wear the wet shoes,” he said. “Speaker Chamal Rajapaksa took a boat to enter Parliament. The MPs and Parliamentary staff came in armoured personnel carriers. We got the services of the Army and the Navy. We had to turn off the power because the area where the transformer was, was also flooded,” said the retiring Serjeant-at-Arms, who among his many other duties, also had the duty of providing a safe and secure environment in the Parliament Complex. “We had a brief session with candlelight. Another exception on that day was that all Hansard reporters were seated inside the Chamber, because they could not hear as there was no power,” he added. He has no doubt been listening to many Parliamentary speeches while in his seat next to the main door of the Chamber. When asked to name the Parliamentarians he liked to listen to the most, he said Prime Minister Ranil Wickremesinghe comes in the first place on that list. The other Parliamentarians he mentioned were Rauff Hakeem, Dr Wijeyadasa Rajapakshe, Dinesh Gunawardena, R. Sampanthan, Mahinda Samarasinghe, Thalatha Athukorala, Gayantha Karunathilake and incumbent Deputy Speaker Ananda Kumarasiri. Asked as to how he compares the ‘dignity and decorum’ of the House during the 22 long years he witnessed Parliamentary proceedings, he remained non-committal. When asked what qualities a Serjeant-at-Arms should have, he observed that the person holding that position must be impartial, intelligent and loyal to the superiors. On August 24 Parliament accorded a ceremonial farewell to Samarasekera. Members from both the Government and Opposition took the floor to appreciate him for a job well done. During the Vote of Appreciation, Minister Rauff Hakeem lauded Samarasekera for truly living up to the motto Disce Aut Discede (Learn or Depart), observing that both of them share the same alma mater - Royal College, Colombo. 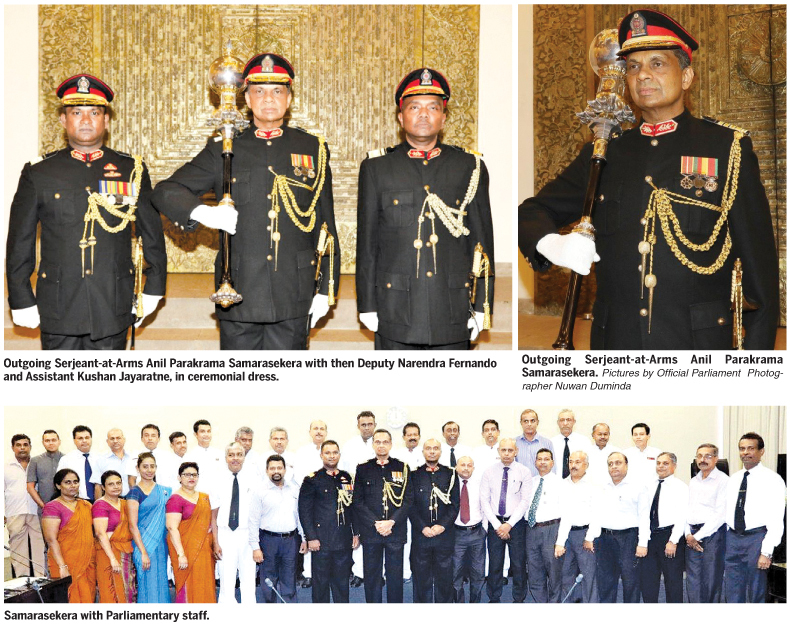 Samarasekera was the fifth to wear the mantle of Serjeant-at-Arms after M. Ismail, J.R. de Silva, Ronnie Abeysinghe and Wijaya Palliyaguruge. 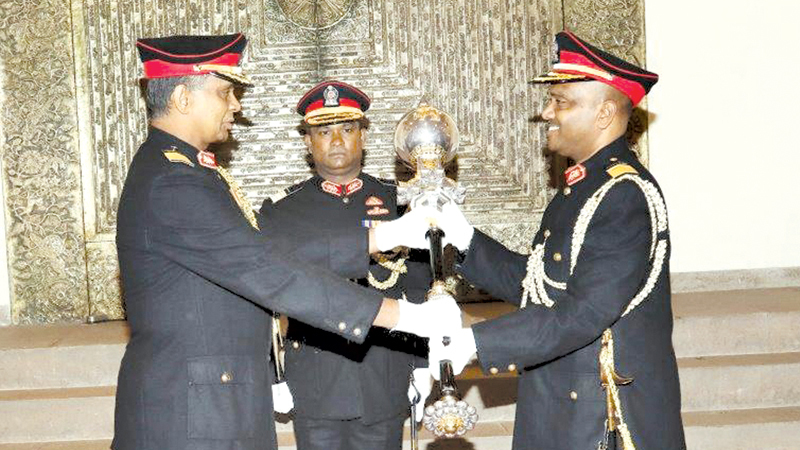 On his last day in the post, Samarasekera officially handed over the Mace and sword, which were traditionally under his custody, to his successor Narendra Fernando.